We looked at the season programming for the 21 American orchestras with the largest operating budgets. * The information we gathered was directly from their official websites and included the most up-to-date information. (For example, it includes the additional two works by women composers that The Philadelphia Orchestra included after they were (ahem) encouraged to diversify their programming.) We only included the regular season “Classical” programs – not “Family”, “Pops”, Chamber Events, or “Holiday” concerts. 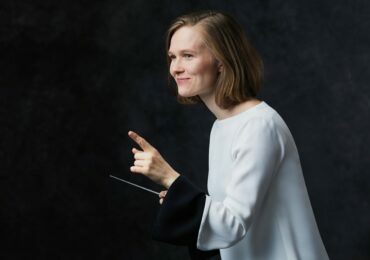 The Los Angeles Philharmonic has a fantastic new music series titled Green Umbrella, however as these concerts are part of the LA Phil New Music Group and not the LA Philharmonic itself, we do not count them, even though there are many exciting new commissions by contemporary women. Last season (2017-2018) seven of the 21 ensembles did not program a single work by a woman composer. It is already notable that for 2018-2019, only four orchestras programmed no works by women: Chicago, Dallas, Pittsburgh, and Houston. To elaborate a bit further: Chicago does not have any works by women included in their regular programming (at least that we could find) – however, they will be performing selections from Florence Price’s Symphony No. 1 throughout the year in various educational programs. And for Dallas, although their 2018-2019 year is desperately lacking in diversity, their new President/CEO has announced a 10-year initiative for more diversity in their yearly programming, including commissions, a composer-in-residence program, and other outreach efforts. Among the 21 different ensembles, a total of 273 different composers will be heard in 2018-2019. This is already a significant difference compared to the 224 composers heard in 2017-2018 – in particular, in the classical music world. Considering the usual rotation of a handful of male composers who typically fill each season brochure, this difference of 49 composers already suggests more diversity, if not of women in particular, then of new voices more generally. Last season, the 21 women included made up a total of 8.6% of the composers; in this coming season the 35 women composers included makeup 12.8% of the total number of composers. This season will include performances of 923 unique compositions – again, a noted change to the 770 individual works heard last season. The 45 works by women composers make up 4.9% of the total number of works – an improvement from the 3.1% programed last season. 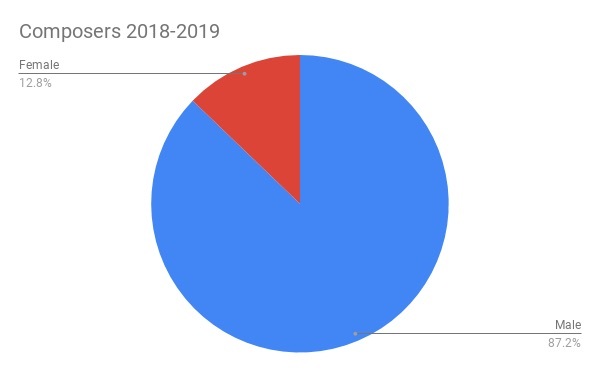 But perhaps the most telling figure that we can look at is the total number of performances – how many times each of those 923 compositions are scheduled among the different ensembles in the season (not including multiple performances by the same ensemble). For example, Beethoven is just one composer, but in the 2018-2019 season alone has 29 individual works being heard a total of 88 performances just among these 21 ensembles. By our count, there will be 1,492 individual performances, including the 88 performances just of works by Beethoven. Of those 1,492 performances there will be a total of 50 performances of works by women. 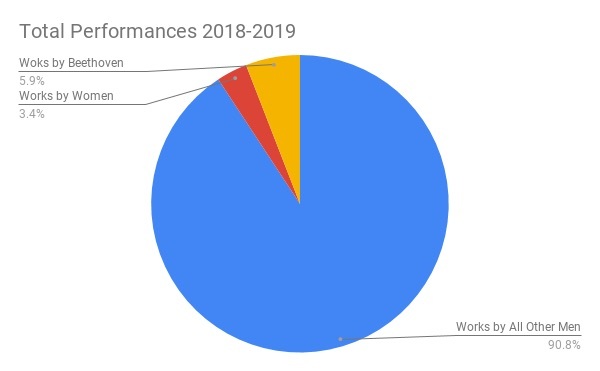 Women’s works will make up 3.4% of all the performances heard among these top ensembles this coming season – which is a tremendous difference to the 1.8% of performances last season. But should we really be celebrating an improvement that adds up to a whopping 3.4%? 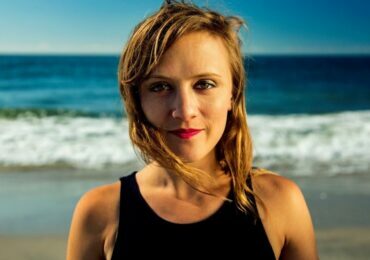 Of the 35 women composers whose works are being heard this year, five are historic women. Much to the converse of the rest of classical music, the works by contemporary women are more likely to be heard than historical simply because they are here to advocate for their own works — they and be seen as well as heard! As a musicologist and historian I am delighted to see two different works by Grażyna Bacewicz, two different performances of Amy Beach’s “Gaelic” Symphony (just a year after her 150th celebration), two different works by Lili Boulanger, Fanny Mendelssohn Hensel’s Overture, and Florence Price’s Symphony No. 3 in full, and Symphony No. 1 in part. 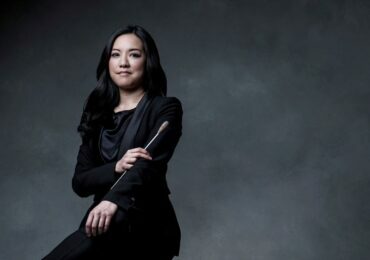 During the 2017-2018 Season the Milwaukee Symphony Orchestra was the winner among the group for the most programmed works by a woman composer, with a total of four pieces. They gave up that title in the 2018-2019 Season to the Minnesota Orchestra who have programmed eight works. Several other ensembles had a good showing, too: Boston programmed six, and Detroit, Los Angeles, and Seattle each programmed five. (See below for information about the performances from each orchestra). Though the numbers are still small, the percentages of representation dismal, it is undeniable that more voices are being heard in symphonic spaces. It is particularly notable that these 21 ensembles – who have the largest budgets and, arguably, the largest influence – are beginning to include diverse works in concert halls in a way that we haven’t really seen before. Giving voice, publicity, and (we hope) recordings to these underrepresented works will help change the canon – and history books.